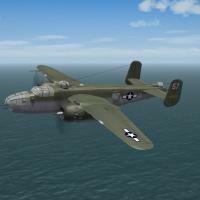 This is a "Theatre Specific" release of Veltro2K's =NEW= B-25J Mitchell Medium Bomber. This represents the "glass nosed" bomber version as used in the MTO. To make installation easier, this is the FULL aircraft, so people don't have to worry about copying files from one mods folder to another. All markings are decals, and Decal Randomization is TRUE. There are several nose arts for the 380th BS, and they have been matched to their correct serial number. There is one "wing art" for the 83rd, but it should -not- be considered fully historical in any way. on the Aircraft Selection Drop down menu. 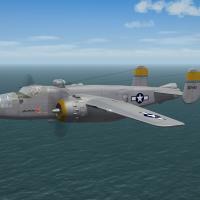 This will differentiate it from any other B-25s you may (or may not) have. As this aircraft makes use of the Invader cockpit, it has an operational bombadier station. Included is the PDF giving instructions on "how to use the bombsight". I'd reccomend not only reading it, but practicing it's use on The Range terrain.